Anglers can enjoy some of the most exciting fishing in Grand Cayman without even boarding a boat. Various flats around the island are home to excellent inshore action throughout the year, and many guides will lead you into the thick of it on foot! The grassy flats of Grand Cayman are home to many species that you can catch year round. The most sought-after fish in these waters are Bonefish, Tarpon, and Permit (the “grand slam”). This coveted trinity is always biting, though Permit is rarely caught these days due to overfishing. 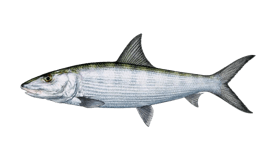 You are very likely to catch Bonefish in spring and summer. 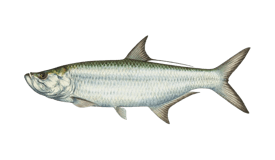 Tarpon are biting most in late summer, on the flats as well as in canals and backwaters. The flats are also frequented by Barracuda, Pompano, Jacks, Snook, Mutton Snapper, and Triggerfish. In recent years, Snook have been spotted more often than before. Your chances of catching one in these waters are fair in summer and fall. You are highly likely to catch Barracuda and Jacks year round, with the possibility of landing a Triggerfish as well. You are most likely to catch Mutton Snapper in winter and spring. You will find anglers in Grand Cayman fishing the flats by spinning with light tackle and fly fishing. Inshore fishing charters may include guided wade fishing or casting from a skiff. Some of the most popular destinations for flats fishing are Prospect Point, Frank Sound, North Coast, East End, West Bay, and Rum Point. You can target Bonefish by casting a heavy bucktail jig tipped with shrimp, or by fly fishing. When fly fishing for Bonefish in Grand Cayman, you can use many of the same patterns as usual so long as they are lightly weighted. The greatest challenge is adapting to the thick grass covering the flats of Grand Cayman, which demands precise casts and slower stripping than average. The Tarpon in Grand Cayman are privy to floating plugs and small, yellow bucktails. It’s best to target Tarpon early in the morning or at dusk. You can fly fish for Tarpon as well, with poppers or bass-bugs. Like Bonefish, you will sometimes find Jacks feeding on the flats. You can target them using virtually any lure or fly. You can also catch these fish by blind-casting off the edges of flats, using flashy flies and a quick retrieval. You can occasionally find Triggerfish on the flats of Grand Cayman, as well. Stealth is necessary, as they spook easily in shallow water. Yarn crabs in #6 should do the trick. Small, heavy Crazy Charlies work well for Pompano. These fish like going after pink, in particular. 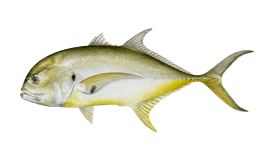 While you are very unlikely to find a Permit, you are sure to entice one with a soaked piece of conch or crab bait when you do. Snook are less predictable than Bonefish and Tarpon. They generally will not chase a lure as far, and they’re unlikely to get overly excited about a topwater lure or fly. Snapper are also tricky to target, but you might reel one in while fishing for Bonefish and other species. You can find them on the flats or the edges of flats, where slow-stripping a fly might prove effective. They will also go for crab bait or a soaked piece of conch.